Summary (from the back of the book): When soldiers arrive at his hometown in Cambodia, Arn is just a kid, dancing to rock 'n' roll, hustling for spare change, and selling ice cream with his brother. But after the soldiers march the entire population into the countryside, his life is changed forever. 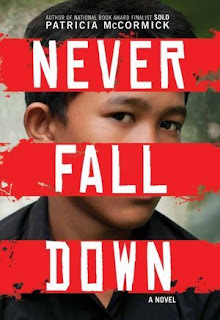 Arn is separated from his family and assigned to a labor camp: working in the rice paddies under a blazing sun, he sees the other children, weak from hunger, malaria, or sheer exhaustion, dying before his eyes. He sees prisoners marched toa nearby mango grove, never to return. And he learns to be invisible to the sadistic Khmer Rouge, who can give or take away life on a whim. One day, the soldiers ask if any of the kids can play an instrument. Arn's never played a note in his life, but he volunteers. In order to survive, he must quickly master the strange revolutionary songs the soldiers demand--and steal food to keep the other kids alive. This decision will save his life, but it will pull him into the very center of what we know today as the Killing Fields. And just as the country is about to be liberated from the Khmer Rouge, Arn is handed a gun and forced to become a soldier. He lives by the simple credo: Over and over I tell myself one thing: never fall down. Review: Such a great book! I have loved all Patricia McCormick's books that I've read (Sold, Purple Heart, and Cut) so am not surprised at how good this one is. Also, ever since I visited Cambodia I have had an interest in the history of the Khmer Rouge, the Cambodian people, and have fond memories of my time there. It's such a beautiful country! No wonder it was a finalist for the National Book Award this year. This novel is written in Arn's dialect. Dialect isn't quite the right word, but McCormick has written it so that we hear his voice as we read. For example, "Ladies in sarong walk so soft like floating on the street." 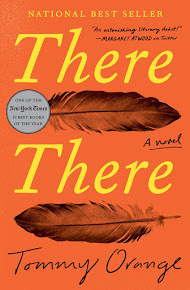 At first this is difficult to read and it felt like the reading would be slow and I was afraid I wouldn't get into the story, but after about five pages I was used to the cadence of it and I realize it makes the reader feel more "into" the story. I have read a lot about the Khmer Rouge, the communist group that took over Cambodia in 1975, and I feel like this book really added to that knowledge. The story is based on two years of interviews with Arn and other people in the book so it is so authentic, rich, and... real. But, it's also gripping, terrifying, and raw. This is not a book for the someone who cannot handle disturbing details. The author's note and the epilogue really bring it all together, letting us know where Arn is today and the work that he is doing, which is great since it means the book ends on a more upbeat note after 200+ pages of tough reading. This book is about the human spirit, survival, humanity, and what humans are capable of, both good and bad.